Have a look at our large collection of round cut, solitaire diamond pendants. 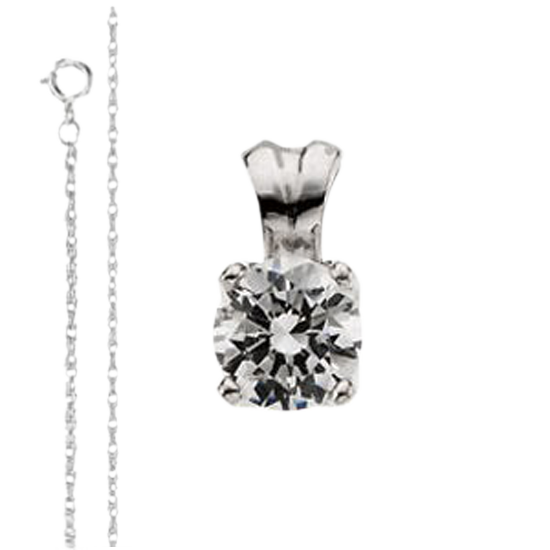 We carry classic elegant designs as well as unique design-based solitaire necklaces. All our round diamond pendants are mounted in 14 or 18k white, yellow, rose or two tone gold. All are set in unique mountings such as four prong, bezel and half bezel settings. Additionally, we also carry many different types of love knot settings for our round diamond pendants. Our chains come in a range of lengths such at 16, 18, or 20 inches in length. We also carry a variety of chain styles such as cable, wheat, rope and snake. With all these available options each round diamond pendant is as unique as your love is for the person that you are buying it for.